Abbott Pulls Plug On Meridia Diet Drug : Shots - Health News The Food and Drug Administration asked the company to take Meridia off the market after recently published results from a study of 10,000 people found the drug raised their odds of heart attacks and strokes. Health products giant Abbott is taking its beleaguered diet drug Meridia off the market. A 13-year-old diet pill is coming off the market because of side effects. The Food and Drug Administration asked the company to do it after recently published results from a study of 10,000 people at high risk of cardiovascular found the drug raised their odds of heart attacks and strokes. "FDA requested this action after concluding Meridia's continued availability is not justified since patients who take the drug are at an increased risk of heart attacks or strokes," the FDA's Dr. John Jenkins said in media briefing. Abbott's move wasn't exactly a shock. European authorities suspended marketing of the medicine earlier this year. 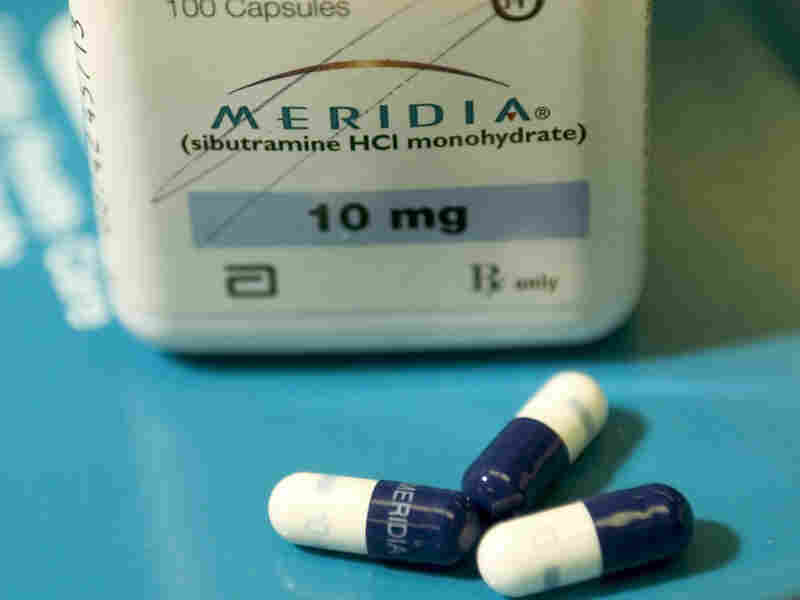 Early in September, editors of the New England Journal of Medicine, which published the latest data, called for Meridia to be taken off the market, saying it was "another flawed diet pill." The drug can increase peoples' heart rates and blood pressure. Last month a panel of advisers to the agency split on whether it should be pulled from the market or allowed to be prescribed with restrictions and beefed-up warnings. Meridia isn't nearly as popular as it once was. U.S. prescriptions had fallen to less than 300,000 in 2008 from a peak of 1.6 million in 2001. In the briefing, an FDA official said less than 100,000 people in the U.S. are now taking Meridia. Abbott, for its part, said the latest data stood "in contrast" to most of the previous research, which doesn't "confirm the excess cardiovascular risk." Separately, FDA warned consumers to avoid a Slimming Beauty Bitter Orange Slimming Capsules because the supplement contains sibutramine, the active ingredient in Meridia. The agency previously found sibutramine in conterfeit versions of Alli, an over-the-counter weight-loss medicine.